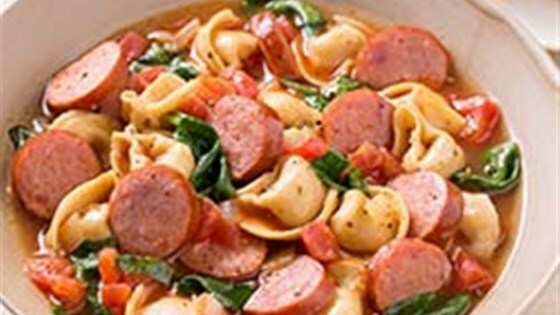 "Nothing is better than a bowl of warm soup filled with cheesy pasta and meaty smoked sausage. Comfort food in 20 minutes!" Heat oil in a large pot over medium heat. Saute onion and garlic in oil until soft, about 5 minutes. Stir in the tomato paste and smoked sausage and cook for an additional 3 to 4 minutes. Add the diced tomatoes, broth, tortellini, salt and pepper and bring to a boil. Reduce heat and simmer gently for 5 minutes, then stir in spinach and cook for an additional 3 to 4 minutes. Serve with a sprinkle of Parmesan cheese, if desired. Added a teaspoon of Italian Seasoning and two shakes of Lawry's Seasoning. It was very good! A good soup and hearty. I did not have fresh tortellini, used dried.